British cycle clothing and accessories label Endura will be packing their truck full of new bike wear, helmets, luggage and eyewear for the journey to Core. Choose Life, Choose Luminite: “Arrive Alive” is the slogan for the upgraded 2013 Luminite range. With the introduction of a new 10x brighter LED lightning technology, more reflective goods and more choice of styles using EN471 (emergency services standard) materials, the new Endura Luminite pieces boast top specs for being seen after dark. Core Bike will be the debut showing of Endura’s road and mountain bike helmets, which have benefitted from the latest computer mathematical modeling techniques to back up the lid’s safety credentials. 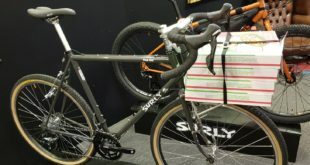 Endura’s new bike luggage range also debuts and is to include seat packs in two sizes, a roller kit bag, 18L and 25L back packs, and a jersey wallet. Each luggage item has been designed specifically for cyclists and is packed with practical details. For example, the multi compartment roller kit bag not only features internal cycle specific compartments for helmets, cycle shoes, gloves and eyewear, but the bag also holds a removable laundry bag and cycle shoe bag, and even boasts a fold out changing mat. The FS260-pro range expands with further women’s pieces, too. Tempting the trade along with the promise of a goody bag, Paligap will also be offering a first look at new lines from Mio, Wahoo Fitness and new brand Cardo. Wahoo flagship Wahoo RFLKT claims to be world’s first iPhone-powered bike computer with all the power of your iPhone in the size of a sleek cycling computer. The Wahoo RFLKT receives data and images from the iPhone wirelessly via bluetooth. Using the buttons on the side of the RFLKT, a user can control the app, change data screens, start and stop the timer, and control other app functionality such as music playback and more. Weighing in at only two ounces, the RFLKT measures 2.4-inch long by 1.6-inch wide by 0.5-inch thick. The unit is coin cell operated, requiring no re-charging. Paligap will also be showing new product lines from Torq, Ritchey and of course the long awaited Cycleops virtual training system. Having completed their first Core in January, Saddleback returns and this year boasts a larger floor space to show off the many brands they represent. The full Castelli Summer range, featuring many new and revolutionary garments, will be on show. 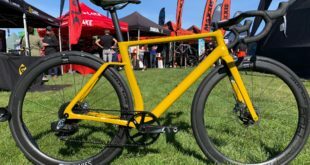 Furthermore, Core Bike will also provide an introduction to the new Castelli in-store dealer tools and a first peek at Castelli’s Pro Tour Team range. In a show exclusive, dealers will be able to secure a one-off set of purple Chris King hubs, part of a limited production run that’ll not be repeated anytime soon. The Smart ENVE road wheel range, as well as the new downhill rims will be on show too, giving the hill bomber an added advantage when ducking and diving through the trees. 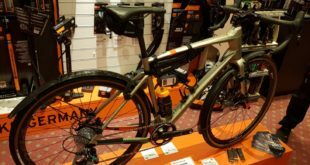 The Saddleback rooms will also see Felt Bicycles 2013 models including the full 29-inch wheeled NINE range and all new Z series road line. Experts will be on hand from all brands answering any tech questions dealers may have during the show. The show will also provide retailers the first opportunity to pick up the 2013 dealer workbook and a goody bag. Polaris promises that in its 25th year, the firm intends to go ‘back to its roots’, which in short means getting filthy in the Peak District. 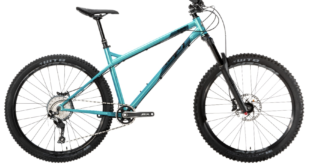 The AM mountain bike range is designed around the needs of mountain bikers and the inevitability of dealing with unfavourable elements at all times of year. Polaris’ new gear accepts this, but focuses on doing so in comfort. The label has therefore steered clear of waterproofs, which it says are difficult to get the level of breathability to be consistently comfortable without spending the kind of money that makes you wince. The all-new AM Vapour is the solution. Thanks to Polaris’ own Vapour Transfer Technology, the garment keeps moisture at bay on the outer, while the inner layer draws moisture to the outer where it evaporates. While not promising to keep you 100 per cent dry in a downpour, it does claim to be comfortable in all conditions – “a bit like a wet suit, only different”, says the brand. Ison will once again be exhibiting new products from the quality brands they distribute such as Halo, MRP, ODI, TSG, Renthal, Surly, Salsa and Identiti. As well as new ranges from these, and many more, Ison have added some new brands to their portfolio. Banshee Bikes, Drift Cameras, Sigma lights and computers and Deluxe BMX all join the Ison stable and will be on show at Core Bike. North Shore bike company Banshee is once again available in the UK and Ison will have the range of full suspension bikes and frames on display. Banshee’s Rune, a 160mm travel enduro machine, is just one of the highlights worth your time. Drift cameras will be releasing the new Ghost HD model, which has some unique features such as video tagging. Mobile phone apps for control and a strong battery life are just a couple more of the user-friendly features. Many international brand managers (as well as Ison staff) will be on hand to guide dealers through the new products. Five years on the trot Citrus-Lime has been meeting and greeting its dealer base and new customers at Core and this year will be no exception. The EPOS specialist uses Core not only to meet retailers, but also to link with suppliers in the trade to boost it’s Supplier Integration Module, which provides system users with realtime stock updates direct from the source and much more. The firm told BikeBiz: “Our R’n’D department has been incredibly busy this year with developments coming thick and fast especially on the Ecommerce front. The new modules and software include our Mobile Ecommerce Solution called ‘Citrus-Store Mobile’, an example of which can be viewed at www.e-outdoor.co.uk and www.ratrace.com. When these sites are accessed through a smartphone it will automatically load Citrus-Store Mobile. Anyone who signs up for and account with Citrus Lime at the show will receive a free iPad Mini (more on page 21).